Now, we invite you to visit The Beach Club! Receive $25.00 resort credit on a one night stay or $50.00 resort credit on stays of two (2) nights or more at The Beach Club. To book click on the link below or call 843-856-0028 and reference Promo Code: THANKS. Offer valid on all new Beach Club bookings through March 2020. Offer not valid with any other discounts, offers or promotions. Exclusions apply. Resort credit cannot be applied to cost of nightly room rate. Promotion valid for limited time and is subject to discontinue at any time. The Beach Club provides an authentic Charleston experience complemented by gracious, personalized service, high-end accommodations, and a relaxed coastal setting. Not only are we Charleston's only LEED certified hotel, but in the Condé Nast Readers' Choice Awards 2018, we were named #1 Resort in South Carolina and #2 Resort in the South. The nautically inspired décor of Harborside blends perfectly with the lush, private beachfront that is perfect for enjoying captivating sunsets over the Charleston Harbor and soaking in the picturesque views of the Holy City. This seaside retreat is ideal for family vacations or relaxing weekend getaways. 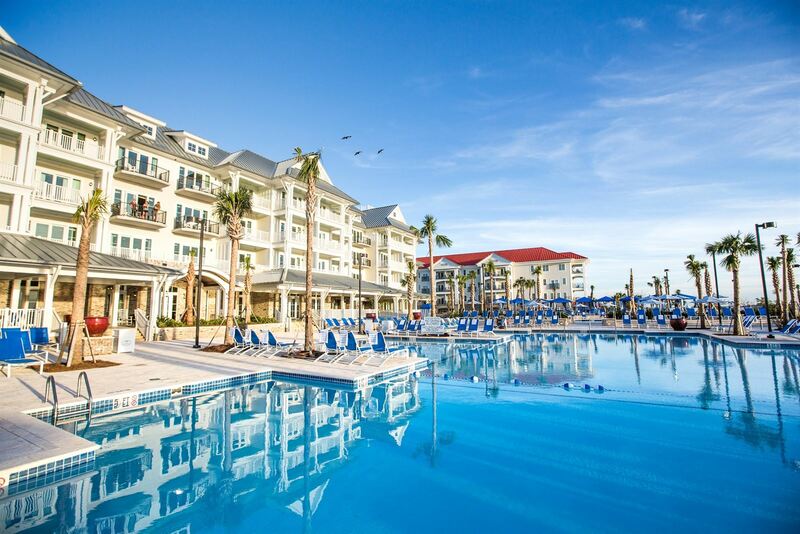 Charleston Harbor Resort is a true one-stop destination resort, offering a 30,000-square-foot tropical pool deck, Charleston's only waterfront Tiki Bar, an educational and interactive children's program, and an array of water activities for the entire family directly from our marina docks. Indulge in a variety of on-site amenities, from local, sustainable cuisine at Charleston Harbor Fish House to rejuvenating treatments at Estuary Spa, voted the best spa in Mount Pleasant in 2016 on TripAdvisor. Charleston Harbor Resort offers five waterfront dining options with a variety of culinary creations and refreshing libations—all guaranteeing a breathtaking view from any seat! Rejuvenate your mind, body, and spirit with services and treatments from the Estuary Spa, including facials, massages, body scrubs, and more. Boone Hall Plantation, the South Carolina Aquarium, Fort Sumter, Sullivan’s Island Beach—these attractions and more await you in beautiful, historic Charleston. Our indoor and outdoor venues are the perfect backdrop for your wedding or special event. Say “I do” on our wedding pier, or celebrate a special milestone in the Yacht Club. Our distinctive meeting spaces evoke creativity, from our state-of-the art executive boardroom overlooking the marina to your own private theater, we have what you need to make your next meeting exceptional. Charleston Harbor Marina—the largest in-water marina in South Carolina—features 450 slips ranging in size from 33-66 feet. The Marina Store carries resort wear for the whole family, nautical and chic home décor, and provisions for a day on the water, plus a spectacular view overlooking Charleston Harbor. Become a member at the Beach Club and enjoy unlimited access to our heated pools, discounted spa services, invitations to resort events, and much more.